Hard as it may seem to believe, depicted is an original piece of hardtack from the Civil War. This was the bread issue for most soldiers during the conflict. Made of flour, salt, and lard, it can remain in edible, if not stale, condition for a very long period of time. Individual crackers were made using cookie cutter type molds and then baked in large batches. Together with salt pork, plain navy beans, and coffee, hardtack was the basic food source for soldiers in the Union Army. Each soldier had his own personal way of preparing the cracker. Some fried it in pork grease, others ate it plain. 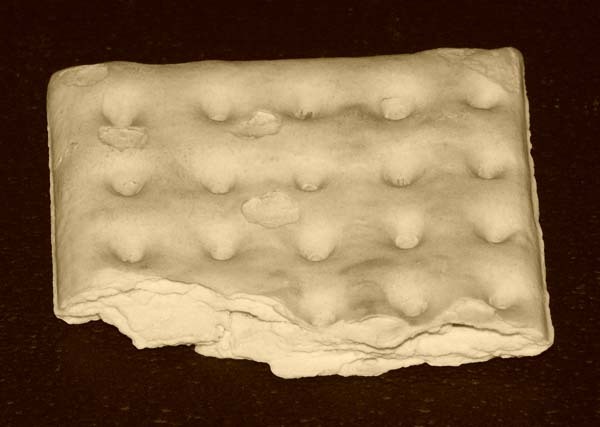 Because of poor storage conditions hardtack was often issued moldy or full of weevils. One account told of a solder who always went into his tent to eat the hardtack. He wanted to eat it in the dark so he would not see the critters crawling in the cracker. Many soldiers kept pieces of hardtack after the war as souvenirs of their military experience. This piece of Hardtack was donated to the Sauk County Historical Museum in 1913. You can see this unique piece of history on display at the museum during open hours.